This compact, portable, adapter lets you use your existing hands-free cellular headset to record your phone conversations. Setup is a breeze - connect your hands-free headset into the adapter's 3.5mm socket, then connect the 2.5mm plug into your cellular phone, and the 3.5mm plug into your voice recorder. Then start recording ! This product is designed for use with voice recorders such as the ones seen on our Portable Voice Recorders page. This product is not designed for use with modern day Smart Phones. 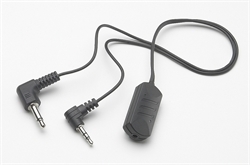 Please see Smart Phone Recording Adapter for your Smart Phone recording needs.